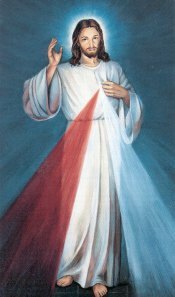 An explanation of the image of the Divine Mercy of Christ, that was given to St. Faustina. Jesus appeared to Blessed Faustina with rays of red and pale light streaming from the area around His heart. His right hand was raised in blessing, recalling the scene of Easter Sunday night (see Jn 20: 19-23). Jesus told Blessed Faustina that this image was to be venerated first in the Sisters' chapel, and then throughout the world (Diary, 47).